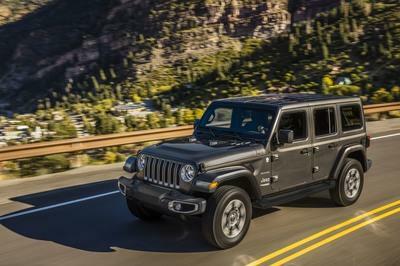 Built on the success of its predecessors with the hopes and dreams to carry on the legacy of an icon, the 2018 Jeep Wrangler JL is the definition of model evolution. It’s not dramatically different, but it’s far from being the same. 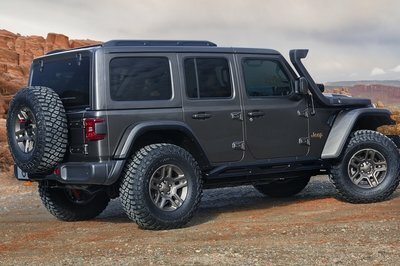 With the JK Wrangler running from 2007 to 2018, it’s quite possible that the JL Wrangler will have as long a stay on the market and it’s a good thing that Jeep did it right. It’s the perfect blend of off-road prowess and creature comforts suitable for those who engage in lengthy road trips. It is the definition of having your cake and eating it too. This generation of the Wrangler comes with improved aerodynamics, improved safety, and plenty of modern tech. More importantly, though, are the removable body panels that carried over from the previous model. There’s also a new power-retractable hardtop, a soft top, and the three-piece freedom top. And, now that the windshield is non-structural, it folds down much easier, and the new A-pillar will provide protection in the event of a rollover. The JL Wrangler has been on the market for more than a year now, and we’re still all googly-eyed over it, so we’ve decided to feature it as our wallpaper of the day. We’ve picked our favorite desktop and mobile wallpapers for you below, but we have a huge gallery at the bottom of the page for you to choose from as well. How agonizing would it be if your car caught fire in front of your eyes and you couldn’t do anything about it? YouTuber Casey Kaiser found himself helpless in a similar situation when his Jeep Wrangler caught fire while he was filming an off-road adventure. 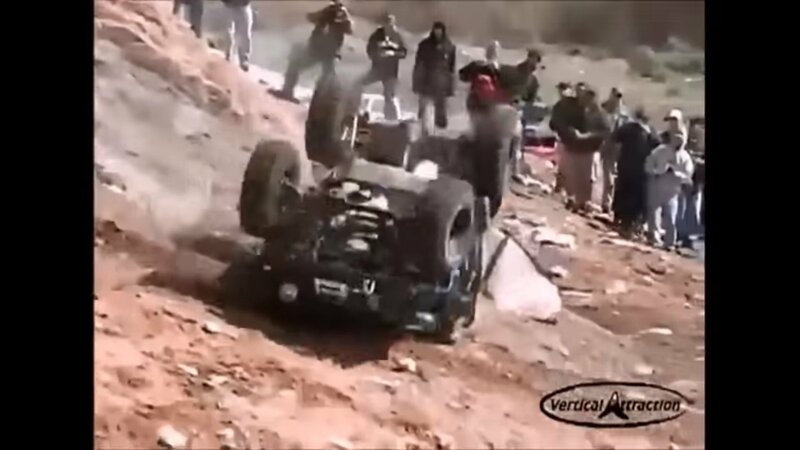 He made it out alive, but the Jeep didn’t. Jeep’s relation with Moab is about to go on a new level with the introduction of the Jeep Wrangler Moab Edition. 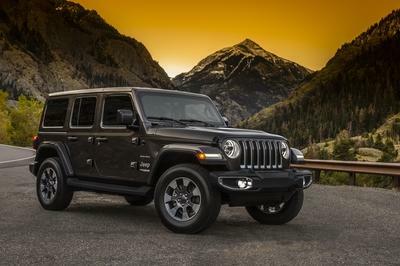 Based on the four-door Jeep Wrangler Sahara, the Wrangler Moab Edition is offered with a smorgasbord of features, some of which it shares with the rugged – and more upscale — Wrangler Rubicon trim. The Jeep Wrangler Moab Edition essentially sits between the Sahara and Rubicon trims, providing customers with another Wrangler option to choose from. There once was a time when body-on-frame SUVs were common sights. But with the advent of unibody car-based bodies, we don’t see too many of the old body-on-frame SUVs anymore. There are still some SUVs in the market whose bodies and frames are two separate entities, so it’s not like you’re absent of any choices if this is the kind of SUV you want. The Cadillac Escalade, Jeep Wrangler, GMC Yukon, Ford Expedition, Chevrolet Tahoe, and Chevrolet Suburban are still considered body-on-frame SUVs, making them extremely useful in the outdoors. 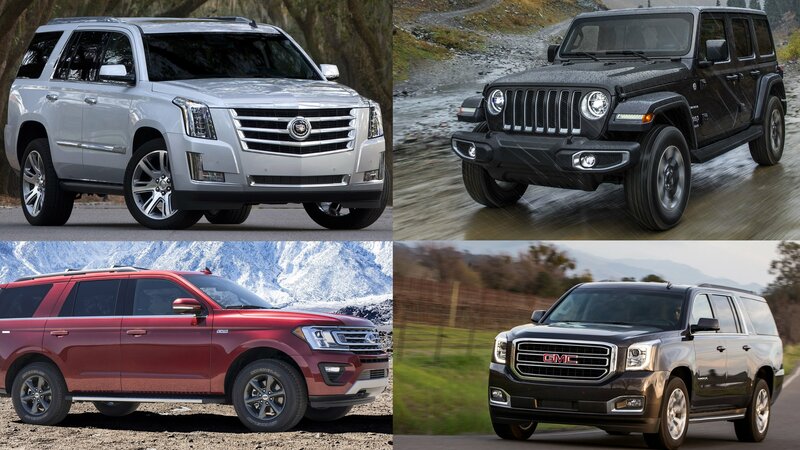 So what exactly do these six SUVs have to offer? Read on and find out. The Jeep Wrangler is All Set For Beach Patrolling in Italy! FCA has given the Jeep Wrangler a new job this summer – to keep people safe at the beaches of Romagna, Italy as a beach patrol vehicle. 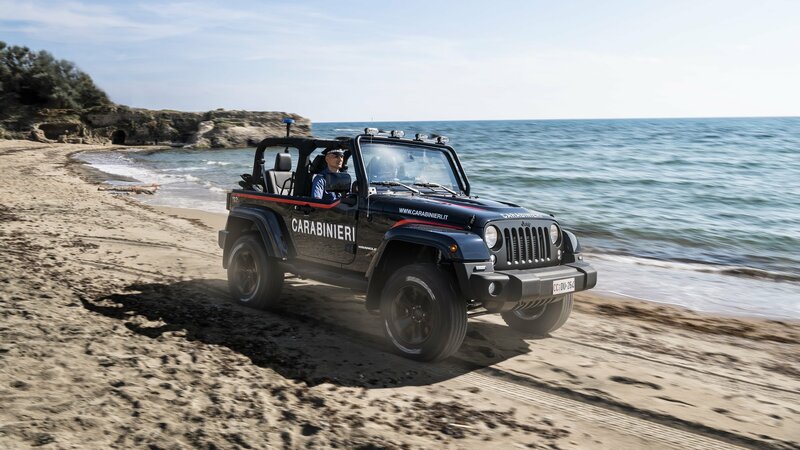 The automaker has presented a custom Wrangler to the Italian ‘Carabinieri’, to patrol an 18-mile area of the Romagna Riviera that includes popular resorts. We’re pretty sure the ‘lifesaver’ will be a tourist attraction as well! 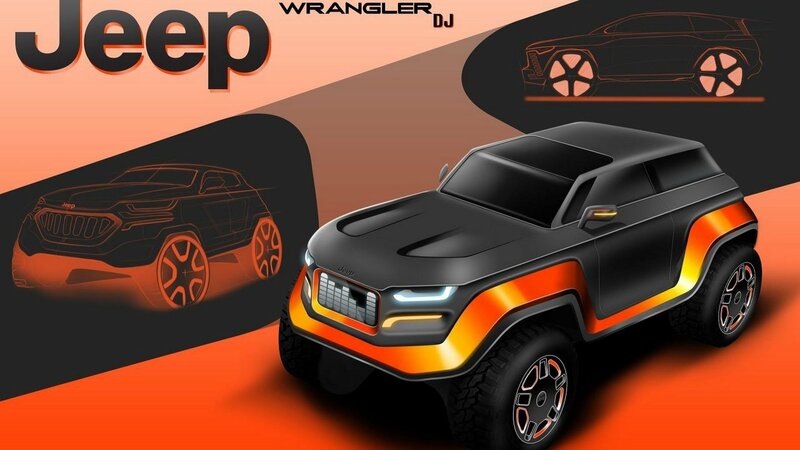 It ain’t easy to break into the world of automotive design, but three talented high schoolers are well on their way to landing their dream jobs, as recognized by FCA in a recent contest to pen the 2030 model year Jeep Wrangler. FCA has been in a bind for the last couple of years with hope of improvement coming from the updated Ram 1500, the new Jeep Wrangler JL, and the upcoming Wrangler-based pickup truck. 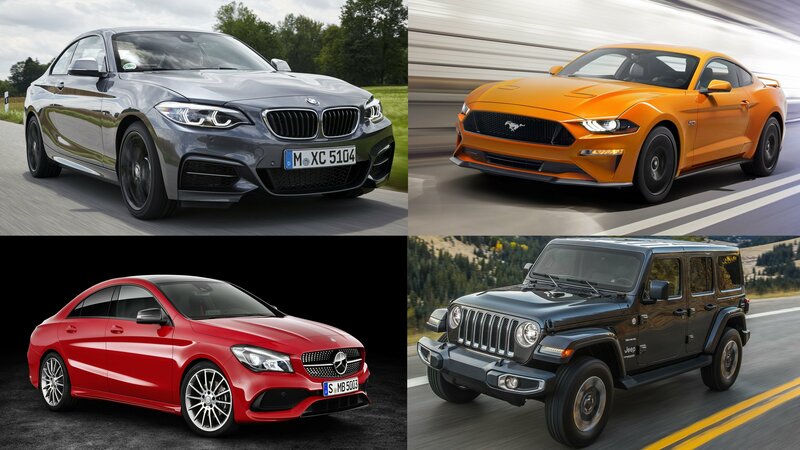 We’ve all seen the mules of the Jeep Pickup truck, AKA the Scrambler, testing on public roads but information about it from FCA or Jeep itself has remained top secret. All that has changed after a dealer meeting that gave just one piece of “new” information – the Jeep Wrangler Pickup will go into production in the final quarter of 2018, with dealerships getting their first haul to sell in April of 2019 – that’s just a year away folks. 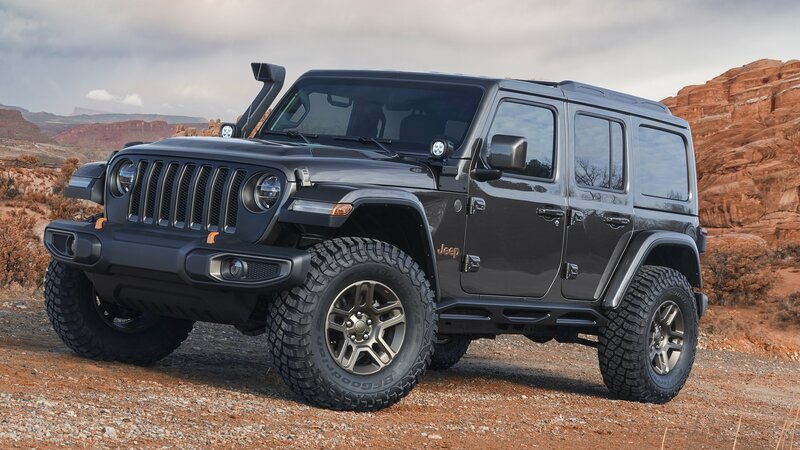 With the 2018 Moab Jeep Safari just around the corner, the legendary off-roading brand is introducing a total of seven new concept cars, including several intended to show off the upgradeable potential of the new JL-gen Wrangler. 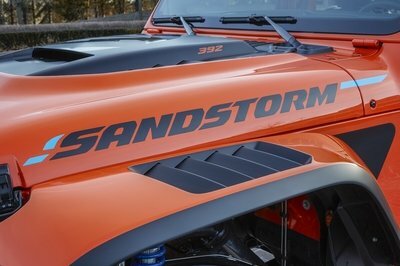 One such concept is the Jeep Sandstorm, which draws its inspiration from the world of Baja racing trucks with a thumping V-8 under the hood and upgraded suspension to match. 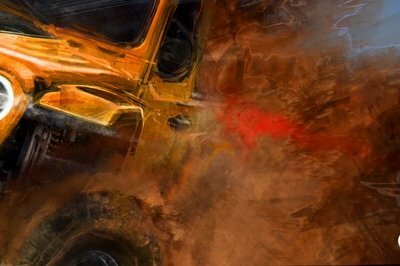 Continue reading to learn more about the Jeep Sandstorm. Like any proper build, the Jeep Sandstorm has a strong theme going for it, taking its inspiration from Baja racers with all the right parts to conquer the desert. “The Jeep Sandstorm concept is all about blitzing long, sandy straightaways while still being capable of handling the daily driving duties,” says Jeep. Let’s start outside, where we find the styling was updated with a carbon fiber hood, complete with a square intake and several rows of vents. More vents were added to the flared-out fenders in front, while a matte black roll cage and rear lay-down spare tire carrier were added up top. The body panels get a bright orange paint finish. You’ll also notice that Jeep shaved the door handles in the rear, while simultaneously tossing the swing gate and chopping down the aft doors. The mods give the machine a cleaner, more streamlined, and more purposeful appearance – exactly what you want for something inspired by a racing truck. Further Baja-esque additions include high-clearance tube bumpers in front and in back, which look ready to plow through all but the hardest of obstacles. The rock rails were also beefed up, and there’s a racing-style fuel filler in the rear to keep the go-juice flowing. The KC Carbon series was tapped for its auxiliary lights in front, not to mention the chase light. In the corners, the Jeep Sandstorm mounts slick 17-inch beadlock wheels, which arrive with a copper-colored inner framework and get wrapped by 39.5-inch Krawler rubber from BG Goodrich. When viewed from the side, you’ll notice that the Jeep Sandstorm gets an extended wheelbase, a mod that should help to cement the vehicle’s stability when traveling at a high rate of speed. To accomplish this, the front axle was moved forward on the chassis by 4 inches, while the rear axle was moved aft by 2 inches, giving it a 6-inch extension overall. The suspension is composed of a heavy-duty longarm four-link suspension and track bar for the front, while the rear uses a triangulated trailing arm and four-link suspension. The individual suspension components themselves were upgraded with custom coilovers and bypass shocks, which give the front wheels as much as 14 inches of travel and the rear wheels an impressive 18 inches of travel. The drivetrain is rounded out with heavy-duty components front and rear, with both ends receiving Dynatrac 60 axles and a 5.68 gear ratio. 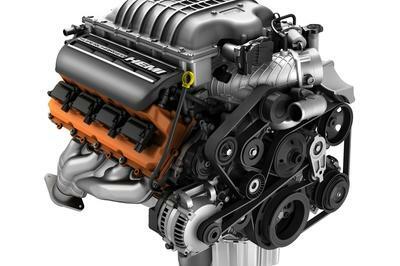 To live up to its racing promises, the Jeep Sandstorm is even equipped with the 6.4-liter V-8 optioned straight out of the Mopar performance catalog. Jeep neglected to mention output figures, but it’s likely churning out around 485 horses and 475 pound-feet of torque. Routing it all is a six-speed manual transmission. Inside, there’s a custom cage that integrates directly with the chassis. The front seats get leather upholstery, while the rear gets low-back racing buckets. Instrumentation includes a racing-spec gauge cluster and a 7-inch off-road GPS for navigation purposes. There’s also an onboard air compressor if you need to perform some impromptu repairs. Adding to the high-performance feel are independent rocker switches for the electronics, air compressor, and axle lockers. Finally, the various interior plastic bits and carpet were tossed, replaced with a tough bed liner material for the floor. Funny enough, Jeep says this thing is still street legal, even with the engine swap and wild suspension pieces. And we’re always impressed when an off-roading monster can play double duty with the day-to-day grind. The annual Easter Moab Safari is about to kick off in Utah, and Jeep is celebrating with a variety of tuned-up off-roaders that are ready to tackle the epic scenery. Joining the fun in this beefy-looking dark silver machine dubbed the Jeep 4SPEED, and it brings a host of upgrades designed to cut out some serious weight and make it even more capable on the challenging terrain it’ll face off the beaten path. 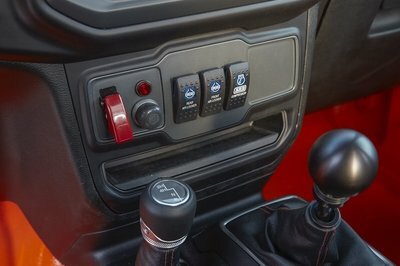 Continue reading to lear more about the Jeep 4SPEED. Much like the Pork Chop concept and the Stitch concept, which arrived at the Moab Safari in 2011 and 2013 respectively, the 4SPEED continues the theme of lightness and agility but cutting out unneeded heft at every opportunity. To kick off the off-roader’s diet, Jeep went with a sizable dose of everyone’s favorite weight-savings material, carbon fiber. The composite was added everywhere on the exterior, including as a replacement for the hood, the flared-out fenders, and the rear tub. In back, there’s a selection of perforated aluminum panels as well, with additional lightweight bodywork to keep it evenly footed front to back. 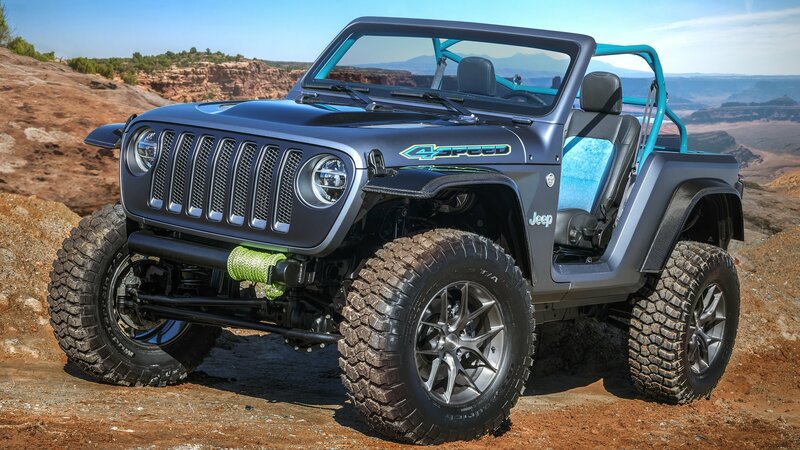 Moving into the sides, we see the Jeep 4SPEED gets a raked windshield, longer door opening, and a sweptback roll cage, all of which combine to give it a new profile. It’s also quite a bit taller thanks to its 2.0-inch lift. Further dimensional alterations are seen with the overall length of the vehicle, which was shortened by a full 22 inches in this build. However, despite cutting down on the front and rear extensions, the wheelbase remains unaltered, which helps to increase the approach and departure angles of the off-roader. Additional off-roading gear includes the installation of Dana 44 front and rear axles with a 4.1- gear ratio. 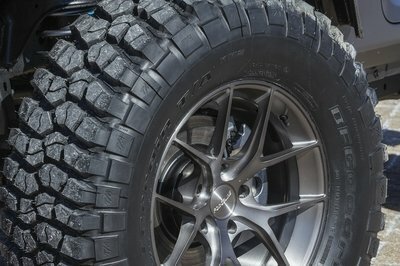 These drive 18-inch wheels with a lightweight monoblock construction in the corners, with the power hitting the terrain courtesy of Mud Terrain rubber from BF Goodrich measuring in at an impressive 35 inches. Finishing it off is a custom instrument panel in the interior, plus seats trimmed in fresh upholstery. The rear seats were tossed out, while a welding curtain was repurposed as a bikini top to cover it up. The color scheme is a bright sky blue in the interior, which does well to brighten the vehicle up against the black and dark silver exterior. Meanwhile, the cabin floor gets a bedliner material for extra protection, and the foot wells use aluminum panels. Unveiled in 2017 and put in production in November, the latest-generation Jeep Wrangler is almost six months old. 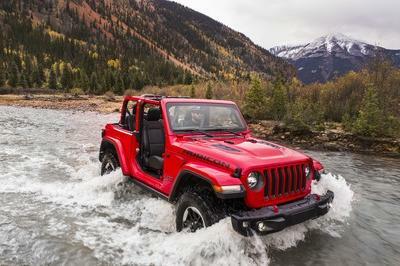 But, while customers were flooding Jeep showrooms to place an order for the JL, the previous-generation Wrangler remained in production until March 2018, for a life-cycle that amounts to almost 12 years, a record for the nameplate. With the JK now officially in the history books, the fourth-generation Wrangler is taking center stage at the 2018 Moab Easter Safari, where Jeep brought various concept vehicles based on the SUV. One of them is the J-Wagon, a premium-styled model that’s as capable on the unbeaten path as it is at home in the urban cityscapes. Based on the Wrangler Sahara, the J-Wagon was personalized with Jeep Performance Parts and a couple of Mopar features. 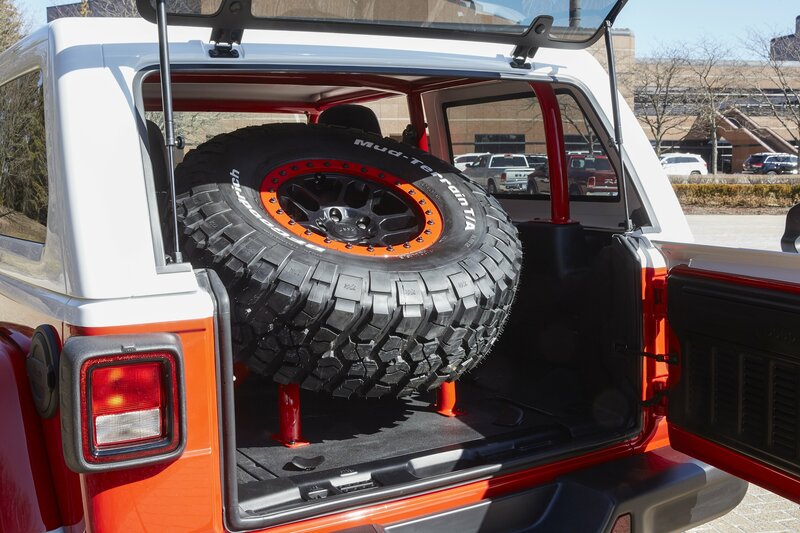 It’s a closed-roof four-door, which explains the “wagon” in the name, but it’s also equipped for proper off-roading thanks to larger wheels and tires and bespoke rock sliders. While many of the parts are still in concept phase, they will most likely become available to purchase later this year, so the J-Wagon is a good example of how you can customize your next Wrangler. Continue reading to learn more about the Jeep Wrangler J-Wagon. The first thing that catches the eye when looking at this concept SUV is the off-road-ready stance. The main features guilty of this look are the big rims wrapped in 33-inch BF Goodrich tires. 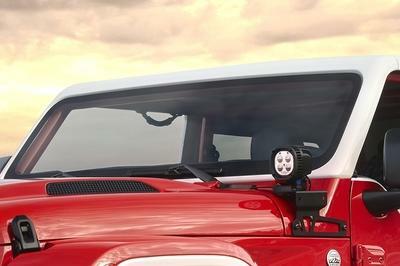 Then there’s the snorkel and the five-inch LED lights that offer military-grade illumination. Upgrades over the stock model continue with a custom engine hood that features a special cutout kit to work with the snorkel. The hood also has a Brass Monkey colored latch and a black “Willys” logo. 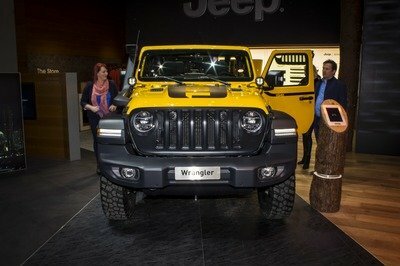 The front grille is also a retrofit element, being sourced from the Wrangler Rubicon model. Below, we can see Orange Crush tow hooks and Brass Monkey foglamps bezels. The wheels are also finished in this special color which was first showcased at the 2017 SEMA Show. Other upgrades include black concept rock sliders for additional body protection and a black roof rack for enhanced utility. The body is wrapped in a conceptual Warm Neutral Grey paint, while the hue of the tinted glass matches the finish. The interior is all about premium upgrades, starting with Camel-colored Katzkin leather seats with Stark Brown piping. The plow-through inserts mimic the triangulated grille design of the concept rock rails. Brass Monkey trim and bezel accents on the HVAC vents, door handles, and steering wheel round out the bespoke interior. No word on what’s under the hood, so it’s safe to assume that the J-Wagon uses a standard drivetrain. Which isn’t bad since all engines are more than capable for off-roading. The annual Moab Easter Safari is a cool event if you like to go off-roading, but it’s an equally important meeting if you’re a big fan of Jeep SUVs. 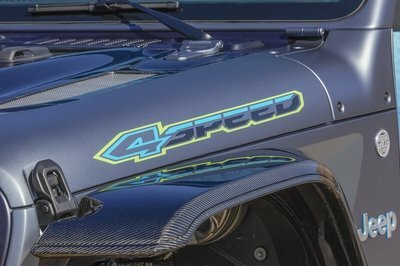 The event is usually packed with cool concept cars from the FCA-owned automaker, with most of them time-based on the popular Wrangler and Grand Cherokee. But, Jeep also built numerous restomods in recent years, including older versions of the Wrangler, the CJ, and even the Grand Wagoneer. For 2018, Jeep prepared a tribute to the 1966 Jeepster using the brand-new Wrangler. And it’s an awesome two-door SUV which proves that Jeep should consider reviving the convertible pickup. The Jeepster nameplate goes a long way back, having been introduced in 1948 by Willys-Overland Motors. Production ended in 1950, but the name was revived in 1966 by Kaiser-Jeep. The vehicle was actually known as the Jeepster Commando or C101; the Jeepster was turned into a small pickup truck aimed at the International Scout, Ford Bronco, Toyota Land Cruiser. Production ended in 1973, and a replacement wasn’t offered until 1981 when Jeep introduced the CJ-based Scrambler. 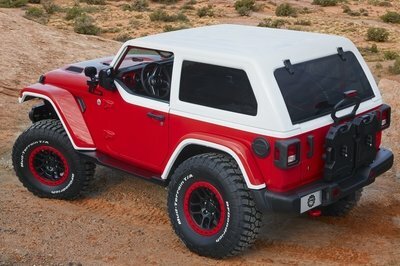 The Jeepster concept is based on the latest Wrangler Rubicon and was put together using a range of Jeep Performance Parts. Let’s have a closer look below. Continue reading to learn more about the Jeep Wrangler Jeepster. Despite the massive stance due to the big tires and the lift kit, the Wrangler Jeepster impersonates the original Jeepster model quite nicely. The two-tone paint is obviously the main reason for that, as it combined a vintage-inspired Firecracker Red body with a Bright White hard-top and windshield, and matching accents on the fender flares and the upper sections of the concept half doors. The windshield was raked back by 2.5 degrees to create a cropped and somewhat sportier look. The roof was also chopped off by two inches for a lower stance. Beyond the color, which evokes the 1966 Jeepster, the modified Wrangler boasts a number of Jeep Performance Parts, starting with a vented, bulged engine hood and five- and seven-inch LED off-road lights. The latter is backed by the production LED foglamps in the steel bumper. Other additions include two-tone 17-inch wheels, tri-color Jeepster badges, and a black fuel door. Inside the cabin, Jeep replaced the standard sport bar with a conceptual, tubular roll cage and added all-weather floor mats for enhanced practicality. For a premium touch, the Wrangler Jeepster received black Katzkin leather seats with red Jeep logos on the seatbacks and red stitching on the bolsters. More red accents similar to the exterior paint can be seen on the dashboard. Finally, Jeep created concept storage packs mounted to the tailgate for transport of gear and supplies, including food, water, and tools. These packs feature a split design to accommodate the rearview camera. While there’s no word of what’s under the hood (most likely a standard drivetrain), the Jeepster rides on a two-inch lift kit and aluminum body shocks. Of course, it’s the massive, 37-inch BF Goodrich K02 tires that stand out and make the concept a full-fledged off-road vehicle, especially when compared to the original Jeepster. Certain automakers own certain events. In the case of Jeep, that event is the Moab Easter Safari, an annual gathering hosted by the Red-Rock 4-Wheelers off-road club in Moab, Utah. Every year, Jeep comes to the event with concept vehicles in tow. It’s no different this year because we have already received a couple of teaser images of what could be the concept rides the automaker is preparing to bring to the Easter Safari. 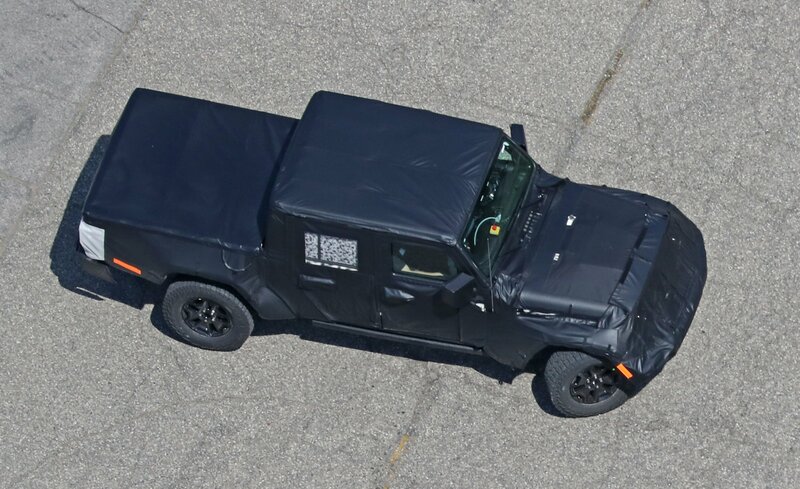 Jeep didn’t mention which models these concepts will be based on, but judging from the teaser photos, they look to be a pair of JL Wranglers. The teasers clearly tell us that those two models are Jeep Wrangler JL models. What’s less clear are the upgrades that both models are carrying. 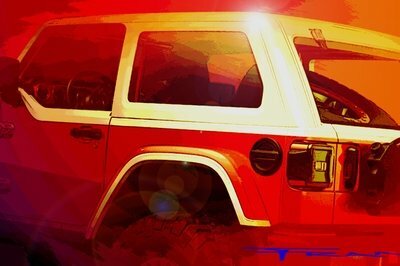 The first teaser looks to be a Wrangler JL that’s dressed in orange body paint. We do see a few noticeable upgrades on the front end, beginning with a bull bar with massive spotlights that have been added to the grille. 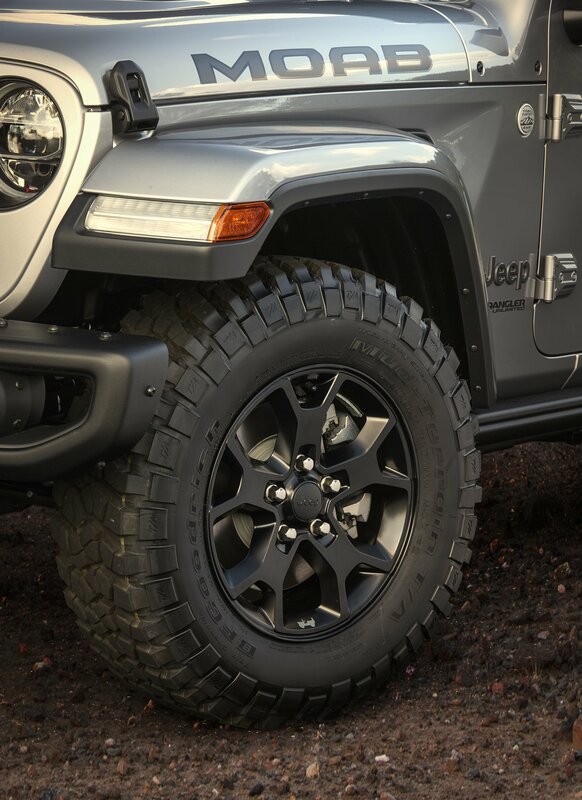 The front fenders seem to have been modified as well, possibly to accommodate a larger set of off-road tires that will help the Wrangler JL conquer any road surface it faces. It’s hard to see if the hood also received modifications — is that a hood scoop? — but if it did, we expect that this particular concept will have a power upgrade under that hood. That’s about all we can piece together at this point. It will be interesting to see what this concept will look like when it’s unveiled. 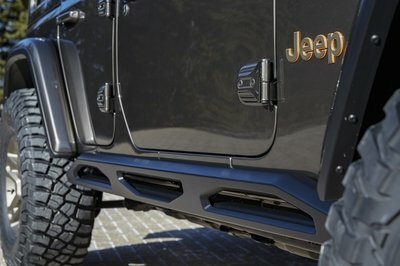 The other teaser photo gives us a good look at the side profile of another Wrangler JL. Unlike the first concept, this one is dressed in a more polished two-tone red and white paint scheme. The way the colors are distributed also has a retro-feel to it that harkens back to those old SUVs from the 80’s. Look closer, and you’ll also see that it has a “Jeepster” badge located just in front of the front door. This is a clear hint that what we’re looking at here is a concept that will carry the “Jeepster” name. Needless to say, our expectations for these two concepts are sky-high. That comes with the territory of expecting great things from Jeep when the Moab Easter Safari rolls around. If anything, Jeep has its work cut out for it because last year’s concepts raised the bar as far as our expectations go. Remember the Cherokee Grand One? 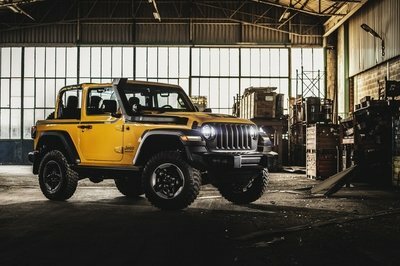 How about the JK Wrangler Quicksand? It’s hard to forget concepts like those when they’ve been imprinted in your minds.